One of the very first cookbooks I bought for myself was the big & bright red ‘Best of Alison Holst’. The book has faded to a dull pink and looks like a visit to the book doctor is in order for some binding support. Everything is a bit loose and saggy from regular use. There are recipes in that book that we return to time after time as they are tasty, easy and use every day ingredients: Potato & Egg Casserole, Pineapple Macaroni & Cheese. The Pasta with Instant Sauce is our go-to recipe when making tea seems too hard, but going out for takeaways is harder still. Check out the Holst online website for more recipes – the lazy lasagne is also a regular in our house. 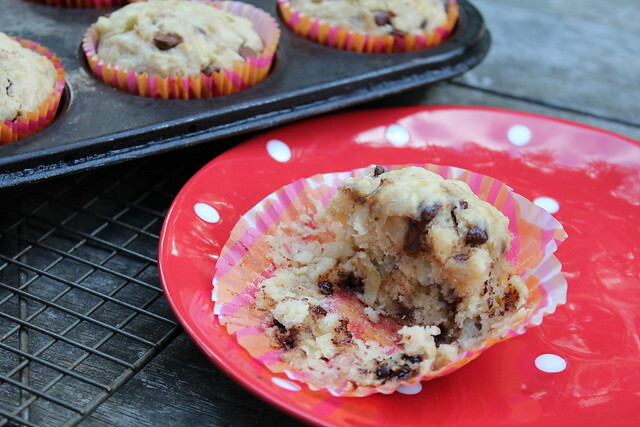 Another super Holst recipe that we make often is the Apple Banana Chocolate muffins. The only changes I make to this recipe is swapping the canola oil for sunflower or rice bran oil as canola oil is an oil I choose not to have in my pantry; increasing the chocolate chips to a full cup, and I use plain flour + baking powder as self-raising flour is not something I keep on hand. I have added extra half cup of mashed bananas in the ‘tweaked by Jo ABC Muffins’ which makes the muffins very moist. 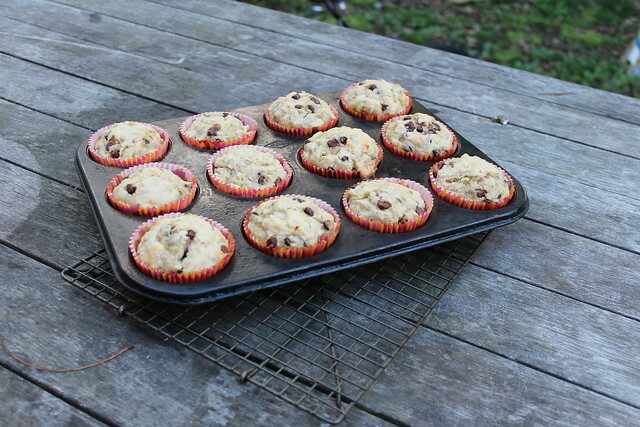 The negative side of very moist muffins is that they don’t keep as well however they are so fudgy that they don’t really need to keep well – in two days the whole lot will have disappeared down the hatch of my three hungry teenagers. The original recipe (before I tweaked it) is a perfect muffin recipe and doesn’t need any adjustments (it isn’t broken so why fix it?) but I find it hard to make a recipe without meddling with it. These muffins (as made to the original recipe) are moist and fudgy – I have made them with Braeburn or Granny Smith apples. Both work really well, and I am sure other variety of apples will also do the trick. I haven’t tried them with the optional lemon glaze but apples & lemons really go well together so it will be an optional I won’t opt out of next time I make these muffins. Simon has posted a Dutch Apple Cake here which combines Apples & Lemon. I eat cake for breakfast, and when there are apples in it, it feels a little bit less like gluttony. Heat oven to 200ºC. In a large bowl, mix together the mashed banana, sugar, salt, oil, egg and milk until well mixed. Stir in the chocolate chips and the unpeeled apple which has been coarsely grated or chopped in a food processor. Shake the flour through a sieve on to everything else and fold together until just dampened. Spoon into 24 mini-muffin pans or 12 medium muffin pans. Bake for 10-12 minutes or until golden brown. Optional Lemon Glaze: Mix 2 T each lemon juice and sugar. Brush over hot muffins. The above recipe (Simon & Alison Holst’s ABC Muffins) is the original. Below is the recipe with my ‘tweaks’. Prepare a muffin tray with 12 muffin papers. In a large bowl, mix together the mashed banana, sugar, salt, oil, egg and milk until well mixed. Shake the flour & baking powder through a sieve on to everything else and fold together until just dampened. Spoon into 12 medium muffin pans. 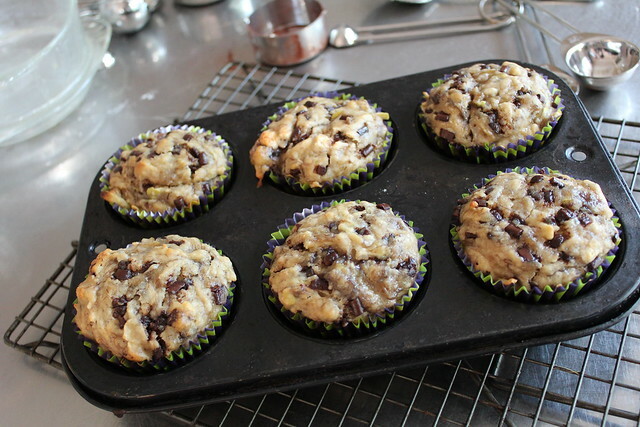 This entry was posted in Baking, Muffins, Recipe Review and tagged baking, muffins by Jo Dohrman. Bookmark the permalink.